The Master. Alfred Hitchcock. It’s amazing it’s taken us this long to discuss a Hitchcock. 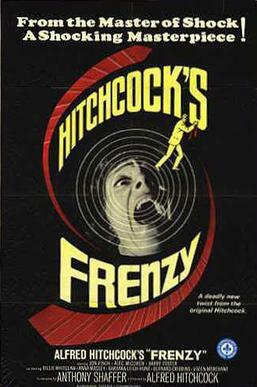 We look at Hitch’s penultimate film, Frenzy. Many people consider this “lesser Hitchcock.” But it’s a taut, exciting thriller with some gorgeous shots. There’s a “necktie murderer” roaming the streets of London. It’s a lot like Jack the Ripper. And the murders of various women are pinned on one “Mr Blaney,” a down on his luck loser who has problems with the missus. But really, Hitchcock plays his hand and actually reveals who the killer is right from the get-go. But there’s enough of a compelling narrative that Frenzy keeps viewers thoroughly interested right until the final frame. Join us this week on the Really Awful Movies Podcast, as we hope to do justice to one of our faves. We love Hitch (that’s Alfred, though Christopher Hitchens is great too). Frenzy has a lot to offer, and Alfred was able to get a little more low-down and dirty with more permissive cultural mores. Join us every week for genre film discussion on the Really Awful Movies Podcast!